I took this image at my grandson's birthday party. The theme was Batman with a very nice cake made by my mom. 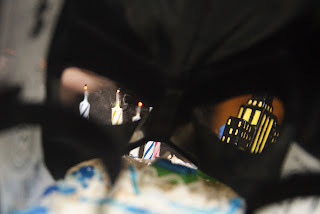 The mask on the cake provided an interesting way to shoot my grandson getting ready to blow out his candles. It is not as crisp as I would like it but it does present an interesting way of creating a scene. 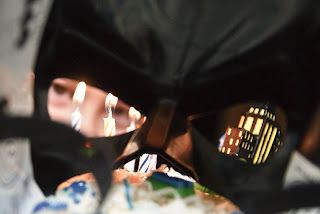 I focused through the left eye as quick as possible and zoomed out to ensure I captured the candle that looked like Gotham City in the right eye and my grandson's eyes in the left eye. The image was taken with the Tamron 17-50 at f/2.8 1/125 second ISO 640 with a slight fill flash.